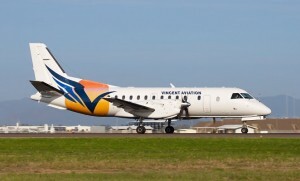 Vincent Aviation operated its first Sydney-Narrabri service on Friday morning. The inaugural flight VIN1 departed Sydney Airport at 0657 on Friday, landing at Narrabri at 0806. The reciprocal flight VIN2 from Narrabri to Sydney departed the central west NSW town at 0851, landing in Sydney at 0947. “The return of a Narrabri service to Sydney Airport is great news for our regional passengers,” Sydney Airport chief executive officer Kerrie Mather said. “The people of Narrabri have been without an air service to Sydney for two months and this new Vincent Aviation service will provide them with the connectivity they value. Vincent Aviation has been awarded an interim licence from Transport NSW to operated five times a weekly (Monday-Friday) return service between Narrabri and Sydney. The flights are operated by 34-seat Saab 340s. Narrabri had neen without a schedule flights to Sydney since the collapse of Brindabella Airlines in December.